Irish Political Maps: Referenda 1968: Constituency boundaries & "First Past the Post"
Referenda 1968: Constituency boundaries & "First Past the Post"
Though the electorate had already given their verdict on the prospect of Ireland switching from Proportional Representation to the "First Past the Post" electoral system, the question was raised once more nine years later. As before, the main rationale for change as far as the government party was concerned was that it would greatly increase its future prospects: majorites of 80 or 90 TDs were predicted to be enjoyed by Fianna Fáil if Ireland did adopt FPTP. Unlike the last time, however, most of the party were not terribly enthusiastic about the idea. Many of the party's younger members - recently promoted to the front ranks by new Taoiseach Jack Lynch, were against the proposal, and it was up to the party's old guard - Seán Lemass and Seán McEntee in particular - to put the case forward for the change. The Opposition parties were as opposed to the change as last time, once again fearing an interminable future of being overwhelmed by Fianna Fáil at the polls. Such was the concern at the time that Fine Gael and Labour briefly considered officially merging with each other to form a stronger party of Opposition. Nonetheless, without a strong campaign by Fianna Fáil for the change, the Opposition parties did not mount a strong campaign against it either - the entire lead-up to the poll was dubbed "the great illusion". that in forming Dáil constituencies, the population per deputy in any case may not be greater or less than the national average by more than one-sixth and that regard must be had to the extent and accessibility of constituencies, the need for having convenient areas of representation and the desirability of avoiding the over-lapping of county boundaries. This proposal would have governed the redrawing of the constituencies under the FPTP system. Under this system, rural constituencies (where Fianna Fáil support was strongest) would be given a disproportionate number of deputies. Such tampering with the system by a party in order to gain itself an advantage was not uncommon in this period - it preceded Fine Gael and Labour's infamous "Tullymander" affair by almost a decade. The proposal was rejected by the people, with the "No" vote winning a clear majority. An interesting pattern can be seen on this map, as well as the next one, taking previous referenda results into account. All referenda thus far had been introduced by Fianna Fáil governments, with each "Yes" victory a victory for the government. In each map, the "Yes" is strongest where Fianna Fáil support is strongest: Donegal, Galway, Kerry and Eamon de Valera's home county of Clare. This pattern continued in 1968, with the "Yes" vote emerging victorious in Clare, Galway West and Donegal - though by a very slim margin in each case, while western counties which voted "No" likewise did so by a small margin. Click on the image to see it full-sized. A greyscale version is available here. (3) To provide that whenever the Dáil is dissolved the outgoing Ceann Comhairle may be returned, without a contest, as a second deputy for a constituency chosen by him which consists of, or includes a part of, the constituency he represented before the dissolution. Again, it was soundly rejected - and even more so than last time. The results were near identical to the Third Amendment, with the only notable differences occurring in Tipperary South and Dublin North East - both still "No" victories. 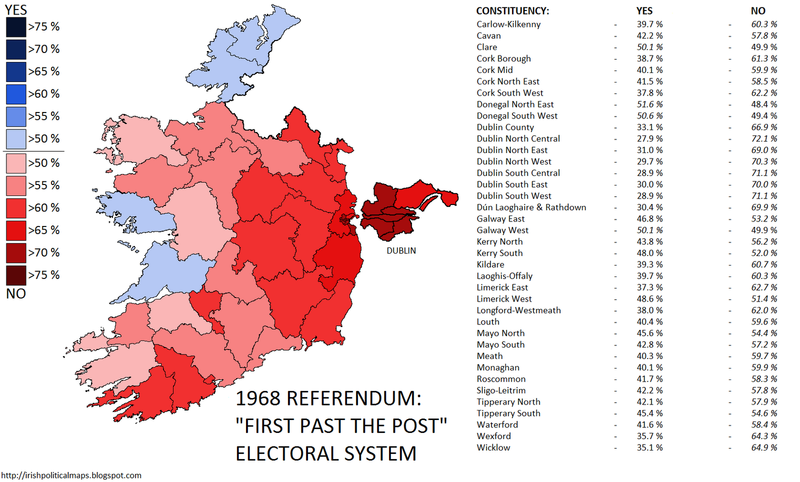 The defeats were seen as a large blow to Fianna Fáil, and the idea of changing Ireland's electoral system to FPTP has not been raised since.